Rotary Club of Richmond donates six hundred and fifty dollars to the Addison Marshall Leukemia Fund. Addison Marshall from Fulshear, has just been diagnosed with an aggressive form of leukemia (Acute Lymphocytic Leukemia) and is a patient at MD Anderson Cancer Center. Without chemotherapy treatment, the prognosis for this disease is extremely grim. Treatment will take approximately 3 years to complete. Addison is determined to fight this disease along with his family and the incredible oncology team from MD Anderson. Addison is a 15 year old sophomore and football player (#65) at FosterHigh School, an "A" student, and Eagle Scout from Fulshear Boy Scout Troop 941. Please join number 65 in the fight of his young life. 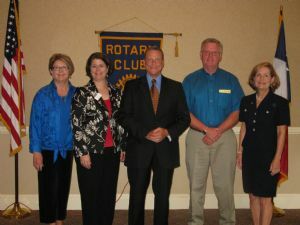 Sue Mitchell, NewFirst Bank, Melody Hess, NewFirst Bank, Jack Marshall, Lonnie Meadows, NewFirst Bank, and Claudia Scott Wright, Rotarian.